« The ultimate travesty of Indian spirituality? The idea that good actions should deserve rewards – and bad ones punishments – is very deep-rooted in us. So much so that religions have held for millennia that divine justice operates on everyone, in one way or another. This, of course, is a matter of belief or speculation, not a testable theory, for no divine agency can be located or investigated. Besides, there are countless examples of people who commit many and great crimes who live out their lives quite comfortably and do not suffer anything that could be considered ‘punishment that fits the crimes’. 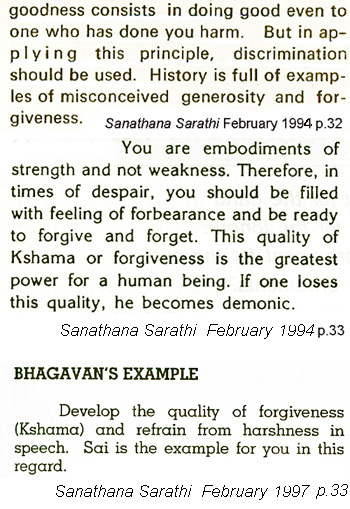 Forgiveness in action is demonstrated most strikingly in the lives of various great persons, and sometimes it has been effective for the perpetrator and also for the forgiver. But that is far from being the rule. it is a remarkably naive and impractical to forgive (as well as forget) crimes and outrages when the perpetrator will neither apologise not change behaviour and desist from the offences. Simply showing remorse through recognition and admission of culpability is not much to ask, not unless positively changed behaviour on the behalf of the offender is also required. Forgiving someone for an evil act – whether against oneself or, what is always easier, against another – unfortunately but obviously does not guarantee an improvement in those forgiven. It is not itself efficient as a preventative to further crime. The two much-quoted Biblical dicta clash: “An eye for an eye and a tooth for a tooth” is confronted by Jesus’ advice to “turn the other cheek” when struck, and to do so repeatedly. These black-or-white alternatives are simplistic, without the nuances required by the many forms conflicts take and also the variety of possibilities of their solution that may be found. 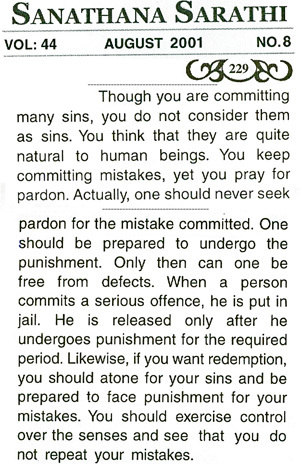 According to Sai Baba’s traditional deism, only an all-powerful God can forgive sins and remove or alleviate the otherwise inevitable reactions called ‘karmic’. However, typically, he also preached the modified view where we can modify our karma by good actions etc. To support the latter, he said that divinity is (also) within us – at least to some degree – so that we create our own karma for good or ill. Forgiving others would bring good returns, not doing so would bring the contrary. However, that undermines the main tenet of the strict and modified karma dogma, for then it is ourselves and not any universal agency or divine law that rewards or punishes and we alone create our personal destiny and our choices decide what is ‘wiped off the slate’. The world has a rich enough supply of do-gooders, proselytisers who proclaim that one must simply and immediately forgive and forget every wrong done against us. But the problem in reality lies in our finding the resources to forgive within oneself. However well-intentioned preachers of forgiveness may be, their dictum ignores inescapable facts of life, and further overlooks the ways in which it is in their belief all regulated by God’s law. Without considering such measures as reaching mutual understanding and agreements on when and how forgiveness can benefit everyone, success in forgiving and forgetting will surely be quite limited. This entry was posted on March 14, 2015 at 10:10 am	and is filed under Sathya Sai Baba. Tagged: Forgive and forget, forgiveness, Jesus. You can follow any responses to this entry through the RSS 2.0 feed. You can leave a response, or trackback from your own site.